This guide is for the Game Boy Advance version. For the PC expansion pack, see The Sims 2: Pets. For the DS version, see The Sims 2: Pets (Nintendo DS). For console and PSP versions, see The Sims 2: Pets (console). 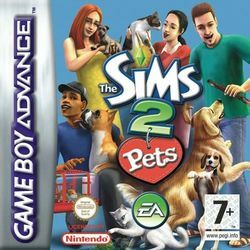 The Sims 2: Pets is on the Game Boy Advance. In this version of the pet-themed game, you create a sim in Bakersville, a well-developed town with several types of shops including pet adoption centers, pet hospitals, pet training skills, cafes and parks. The game plays a lot like the original PC game in that you control a sim and have to satisfy needs. On top of this are the pets and your sims main job in caring for the towns pets. Keep caring for your sims pets in order to gain money so that you can increase your amount of pets. It's classic The Sims gameplay right on your Game Boy Advance. This page was last edited on 24 October 2009, at 19:57.